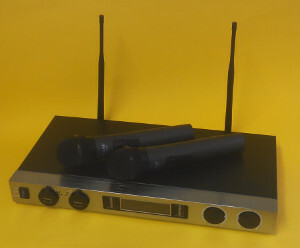 High Quality, rack-mountable, twin-channel UHF Wireless Microphone system with a typical operating range of >40m. The system uses dual diversity technology, automatically selecting the most efficient frequency for each microphone. The receiver can be either free-standing, or rack-mounted. Rack-mount brackets are included. The main unit is powered by an external power supply (included). The microphones can be powered by either 2xAA alkaline cells (sold separately) or rechargeable lithium batteries (included). Battery holders are supplied for both options. To aid convenient recharging of the lithium cells, two charger sockets are provided on the main unit's front panel. The receiver front-panel also features an on/off switch, LCD display and independent microphone volume controls. The rear panel includes the antennas, DC input, mixed audio output via 6.35mm jack and mic 1 and mic 2 output via independent balanced XLR 3-pin XLR plugs. 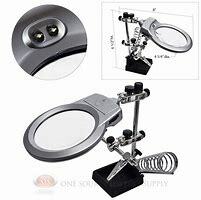 Each hand-held microphone has an integral LCD display and an on/off switch. This product was added to our catalogue on Monday 23 July, 2012.